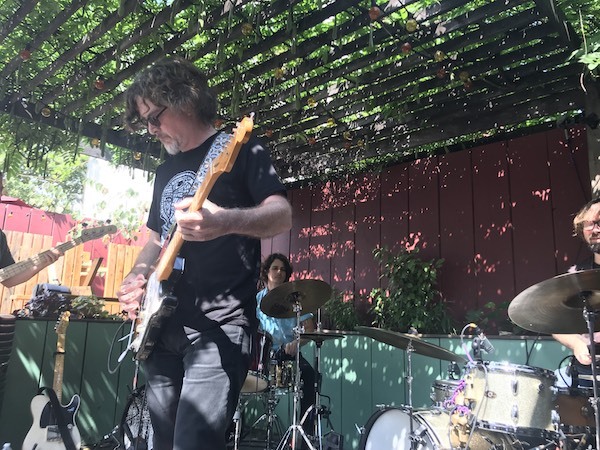 41 search results for "forsyth"
After playing as a trio for the last couple-ish years, the Solar Motel Band is back to a quartet, having debuted their new dual-drummer lineup last month with shows at Monty Hall and Union Pool. Ryan Jewell (re-)joins the so-called “Sunwatchers Motel Band” lineup of Forsyth, Peter Kerlin, and Jason Robira. We caught the daytime set at Union Pool’s Summer Thunder outdoor stage, where the band played three new songs and more to a good-size crowd of folks willing to brave the heat. I’m never one to scoff at new Solar Motel tunes, but the real gem here is this ripping, sixteen-minute performance of “Dreaming in the Non-Dream.” Can’t wait to hear more from this lineup! No matter how many times we see Chris Forsyth & the Solar Motel Band, we always have something new to look forward to. This set celebrated the official release on No Quarter records of Dreaming In the Non-Dream, whose material we had heard live in various stages of completion over the past year. The outstanding final album versions are a can’t miss, so it was interesting for us to see how they’ve evolved live since the album’s release. This show at Union Pool covered three quarters of the album (meaning, three out of four songs) as well as two favorites from The Rarity of Experience, “High Castle Rock” and set-closer “The First Ten Minutes of Cocksucker Blues.” Forsyth broke this show into three parts, which he characterized as the “high-impact instrumental section, the singing section, and the long section.” As Forsyth regulars, we were jazzed to get a rare cover — Neil Young’s “Don’t Be Denied” as part of the vocal portion. But really, any appointment with Chris and his excellent band is one worth keeping. Catch them out on the road stateside for a few November shows, including November 18 at Brooklyn Steel with Luna. I recorded this set with MBHO cardiod microphones, together with Doug’s house. The sound quality is excellent. Enjoy! Yep, you read that right: November 13, 2015. This one’s from the archives, at a fan’s request. 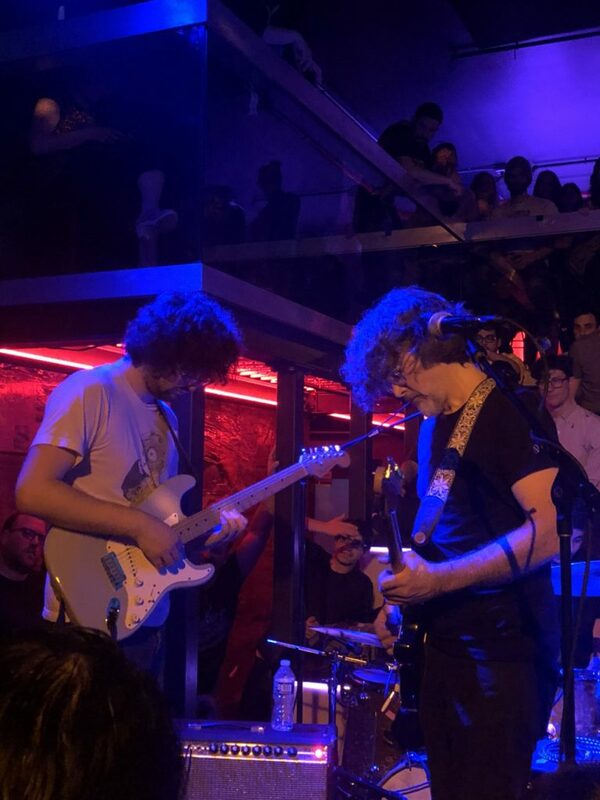 This is Chris and Nick in Solar Motel Duo form, opening up for Lee Ranaldo the night after I had seen the full band opening for Futurebirds at the Bowery Ballroom. What can I say except that I’ve seen a lot of Solar Motel shows and this one’s something unique—just a pure dual guitar mindmeld on some Solar Motel tracks you know and love. I recorded this at the stage lip, the left mic picking up mostly Nick’s guitar and the right Chris’s guitar. The sound is excellent. Enjoy! What we got to see last week at Secret Project Robot was one of those rare one-off performances that neither fan nor artist forgets. For Chris Forsyth, a longtime favorite of this site, Loren Connors is a foundational figure, one of the reasons he plays the way he does. Connors’ influence on modern guitar is boundless; I’d recommend reading Marc Masters and Grayson Haver Currin’s Out Door piece for a proper primer. You can imagine, then, the anticipation that Chris felt in being able to collaborate with his hero on this improvisational set. 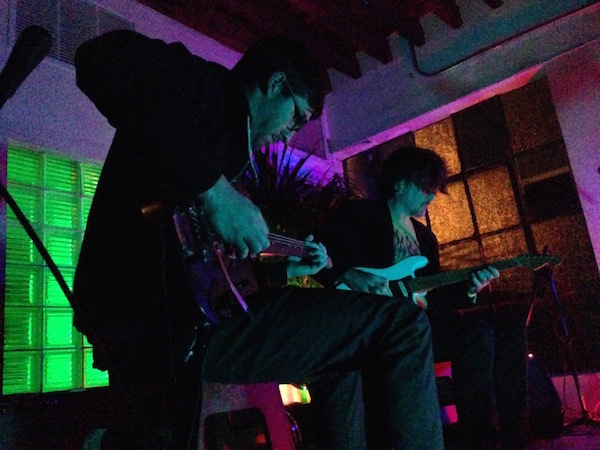 Connors began alone, creating a pensive, curious soundscape. The piece evinced Connors’ oft-cited unpredictability, with an alien, searching quality that laid the perfect base for Forsyth’s entry into the mix. Together, the pair created something wholly theirs, a piece whose periodic squalls recall the summer thunderstorms of the past couple weeks. Needless to say, this is a moment that won’t be repeated, and we’re thrilled to have captured it. I recorded this set with Schoeps MK4V microphones directly in front of the artists. The sound quality is excellent. Enjoy! You can listen to this set live online on WFMU during “What Was Music” with Marcel on Tuesday, August 16 from six to nine A.M. (this should play around 7am or so). 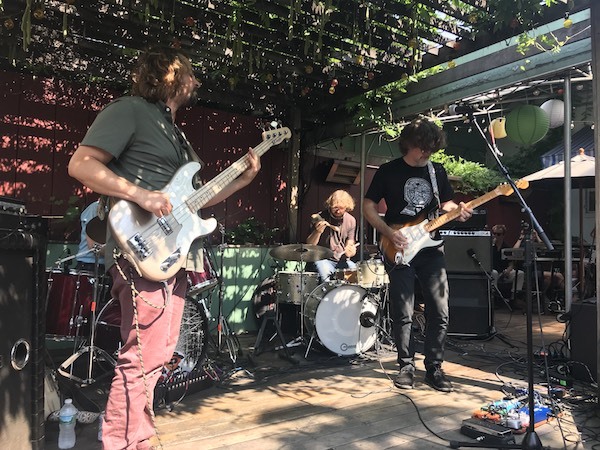 Chris Forsyth and his Solar Motel gang just finished up a tour with the Pacific Northwest’s monsters of psych, Heron Oblivion, and the NYC area was blessed with two stops, first at Jersey City’s WFMU Monty Hall and the second at Union Pool. Naturally, we were there at Union Pool to capture their performances (including openers and fellow Philadelphians Spacin’ which we’ll have up soon). Forsyth’s set gives us a lot to chew on: an extended, exploratory rendition of “The First Ten Minutes of Cocksucker Blues” and some of his finest vocals yet on “The Rarity of Experience, Parts 1-2.” In the group’s tradition of bringing covers out on the road—we’ve previously caught a couple renditions of “The Calvary Cross” and most recently the Dead’s “Cold Rain and Snow”—this tour saw a relentless version of The Dream Syndicate’s “The Days of Wine and Roses.” Rounding things out is the ponderous “Harmonious Dance,” ending things on the quiet side before Heron Oblivion stormed the stage. Forsyth & Co. will be back in town for another superb bill with Oneida at the Knitting Factory. Buy your tickets early and often; we’ll see you there. I recorded this set from our usual location in the venue, with a board feed from FOH Leah. The sound is excellent. Enjoy! Chris Forsyth extended a recent run of excellent work with The Rarity of Experience, a double LP that earned plaudits from Pitchfork to The New York Times. Much has been made of the record’s unequivocal commitment to out-and-out riffage, but that has always been Forsyth’s MO with the Solar Motel Band. The side of him that produced The Island, the delicate, mellowed out collaboration with Koen Holtkamp, is still out there, but when he takes the stage with this band, expect an out and out rock show. 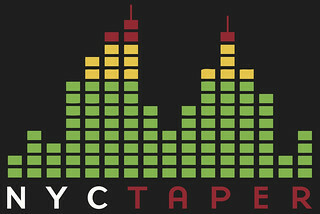 That’s what we got at this NYCTaper-sponsored show at Trans-Pecos, which represented the formal NY album release party for the record. Things kicked into high gear immediately with “High Castle Rock” from the new record, followed by its appropriately-named Anthems I and II, and then its title track. Our only detour to Forsyth’s earlier work came in the form of “The Ballad of Freer Hollow” from 2014’s Intensity Ghost, which nestled in well with the extended two-part jams “Anthem” and “The Rarity of Experience” (notable also for adding vocals to the mix). In a nod to the band who inspired so much of improvisational guitar music (not to mention the practice of fan-based live concert recording), Forsyth and crew gave us their take on the Dead’s “Cold Rain and Snow.” It was a worthwhile reminder that while Forsyth’s name is front and center in the proceedings, part of what makes these performances special is the interplay among a very, very talented group of band members. Forsyth’s delivery wouldn’t be what it is without bassist Peter Kerlin and drummer Ray Kubian doing more than just making a backbeat, nor fellow guitarist Nick Millevoi providing the other half of the guitar attack. You don’t get a sound this all-encompassing with a “solo” artist and some guys; this is truly a band. And, for those of you who missed them this time around, head to Union Pool on May 28, where you can catch the band opening for Heron Oblivion. I recorded this set with a pair of Schoeps MK22 microphones at the stage lip, another pair of Schoeps MK4V back by the soundboard, and a direct soundboard feed of house engineer Ned’s mix. The sound quality is outstanding, and a perfect representation of the enormity of the Solar Motel Band’s sound. Enjoy! If you enjoyed this recording, please visit his website and buy The Rarity of Experience from No Quarter Records.